Political situations come and go but trust is the foundation of civilization itself. 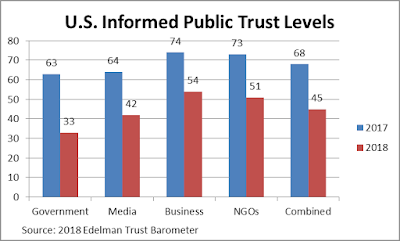 So I was genuinely shaken to see a report from the Edelman PR agency that trust in U.S. institutions fell last year by a huge margin – 17% for the general public and 34% for the “informed public,” placing us dead last among 27 countries. All four measured institutions (business, media, government, and non-governmental organizations) took similar hits, although government fell the most. You won’t be surprised to learn that concerns about fake news and social media are especially prominent. What’s less expected is that trust in traditional journalism actually increased in the U.S. The over-all decline in media trust resulted from falling confidence in news from search engines and social media. Similarly, world-wide trust increased in traditional authorities such as technical, academic, and business experts. So there are rays of hope. Digging deeper, the sharp fall in U.S. trust levels follows two years when levels were exceptionally high. 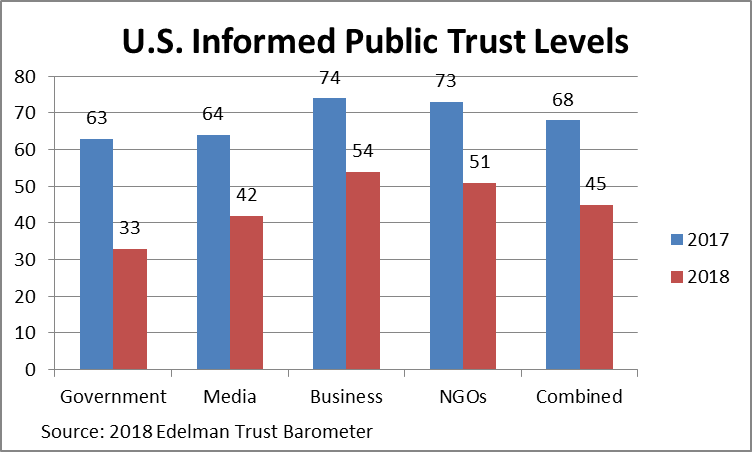 The current U.S. trust level is roughly the same as the four reports before that. Maybe you shouldn't head for that doomsday cabin quite yet. Still, other reports also show tremendous doubts about basic questions of truth. A Brand Intelligence study comparing brand attitudes of Democrats vs. Republicans found that eight of top 10 most polarizing brands were news outlets. World-wide, 59% of people told Edelman they were simply not sure what is true and just 36% felt the media were doing a good job of guarding information quality. The social implications of all this are sadly obvious. But this blog is about marketing. How can marketers adapt and thrive in a trust-challenged, politically-polarized world? Protect privacy. Consumers can be remarkably cavalier in practice about protecting their data: this McAfee report found 41% don’t immediately change default passwords on new devices and 34% don’t limit access to their home network at all. But they are adamant that companies they do business with be more careful: Accenture studies have found that 92% of U.S. consumers feel it’s extremely important for companies to protect their personal information while 80% won’t do business with companies they don’t trust. Similarly, a Pega survey found that 45% of EU respondents said they would require companies to erase their data if they found it had been sold or shared with other companies. Personalize wisely. Accenture also found that 44% of consumers are frustrated when companies don’t deliver relevant, personalized shopping experiences and 41% had switched companies due to lack of personalization or trust. So there’s clearly a price to be paid for not using the data you do collect. Similarly, an Oracle report found 50% of consumers would be attracted to offers based on personal data while just 29% would find them creepy. In fact, consumers have a remarkably pragmatic attitude toward their data: 24 survey found their number one reason for sharing personal information is to receive discounts. This has two implications: ask consumers whether they want personalized messages (or any messages), and be sure the value of your personalization outweighs its inherent creepiness. Use trusted media. Consumers’ attitudes towards media in general, and social media in particular, are complicated. We’ve already noted that Edelman found growing distrust in online platforms. Other studies by Kantar and Sharethrough found the same. But consumers still spend most of their time on search engines and social media, which GlobalWebindex found remain by far the top research channels. Yet when it comes to building awareness, a different GlobalWebIndex report found that social ranked far behind search engines, TV, and display ads. Further muddying the waters, social and ecommerce companies (Facebook, Amazon, and eBay) topped NetBase’s list of most loved brands while Google ranked just 29th. But love isn’t the same as value: a LivePerson survey of 18-to-34 year olds – presumably the most enthusiastic social media users – found most would delete social apps from their phones before they'd give up practical apps for banking, ride-sharing and shopping. Similarly, The Verge found that Amazon and Google were significantly better liked and trusted than Facebook or Twitter. Taken together, this suggests that marketers need social channels for scale but can’t rely on them for credibility. Indeed, that’s precisely the conclusion of this Trusted Media Brands report about branded video. Consider brand safety. 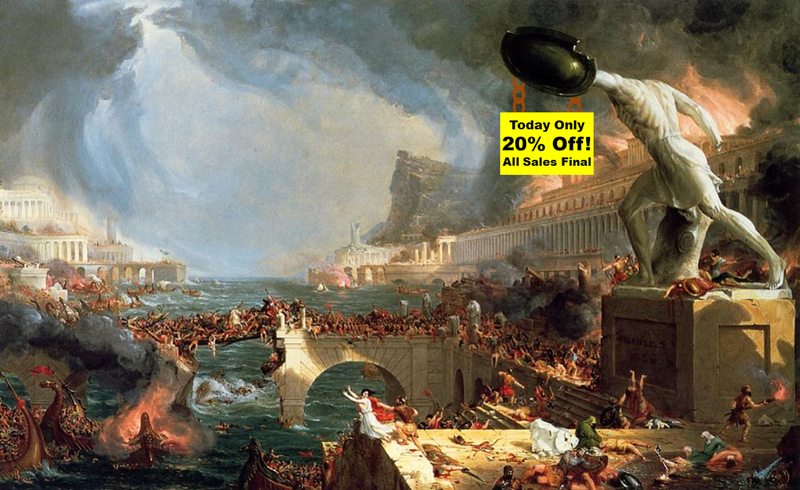 The problems with social and display channels extend beyond general mistrust to actively offensive environments. GumGum found that 68% of brands knew their ads have been placed in objectionable environments, with fake news, divisive politics, and disasters heading the list. A Dun & Bradstreet report on programmatic B2B ads similarly found that 66% of brands have found brand safety increasingly important. Ad fraud is also a major concern – the two are related because they both reflect brands’ loss of control over their ad placements. This Forrester report on mobile advertising found 69% of marketers felt at least 20% of their budgets were exposed to found mobile ad fraud. Yet all three studies found marketers were plunging ahead with just limited efforts at brand safety and fraud prevention. In a world where consumer trust is tenuous to begin with, this is a very high-stakes gamble. Be careful about politics. Edelman found that 64% of people want business CEOs to lead change rather than waiting for government to impose it. Sprout Social reported a similar finding: 65% of U.S. consumers felt brands should take a stand on social/political issues and 59% felt CEOs in particular should step in. But Euclid found the opposite: 78% said brands should avoid making political statements. Even more extreme, Bambu found just 2.3% of consumers said posting political content would make them more likely to buy from a salesperson while 34.9% said posting political content was a deal breaker, regardless of whether they agreed. Still, the real danger is taking a position the customer dislikes: Bambu, Euclid and Sprout all found consumers are likely to boycott firms based on their positions. Sprout noted some compensating gain from people who agree but the net benefit is questionable at best: people are slightly more likely to praise a brand when they agree (28%) than criticize when they disagree (20%). But fewer will recommend it (35%) than warn friends and family (38%) and, most critically, fewer will purchase more (44%) than purchase less (53%). In short, the data here are wildly conflicting: people want businesses to lead but they’ll punish behaviors they don’t like as often as they’ll reward choices they agree with. Of course, widely popular positions are still safe but many issues today have large numbers of people on both sides. And remember it’s still possible to annoy everyone: Brand Intelligence found that Democrats, Independents, and Republicans all had Diet Pepsi (Kendall Jenner commercial, presumably) and Diet Mountain Dew (I don’t know why) on their most disliked lists. The ultimate result is probably that business leaders can justify being as active or inactive as they personally prefer. So there you have it. Assuming we avoid complete social collapse, marketing in today’s polarized, anxiety-ridden world poses unprecedented challenges. Ironically, the loss of trust is happening at the precise moment when physical products are being replaced by trust-based services such as subscriptions and automated recommendations. The stakes couldn’t be higher. Choose carefully and good luck.